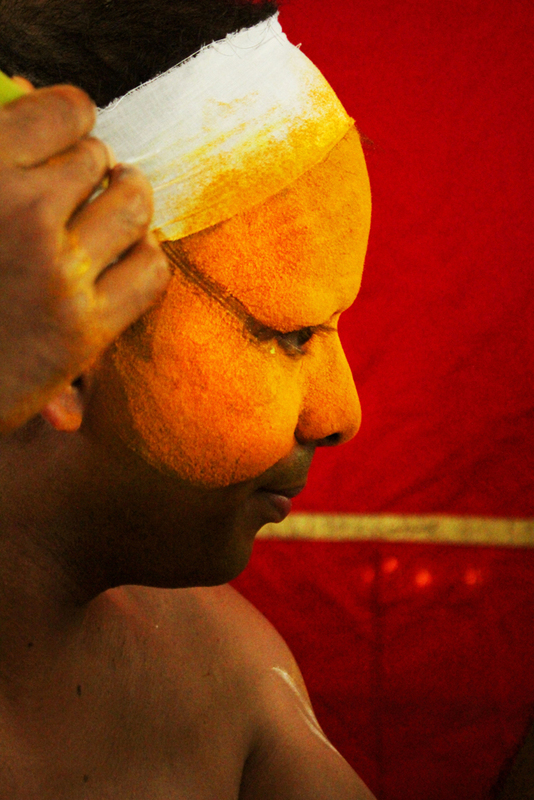 Mukhathezhuthu or facial make up is distinctiveness of each theyyam which makes them unique. 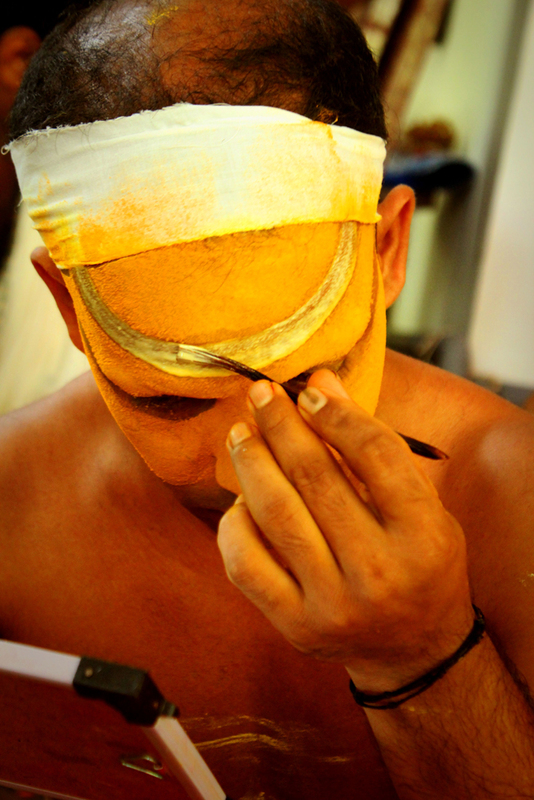 The performer doing Mukhathezhuthu by using natural products turmeric and rice paste. 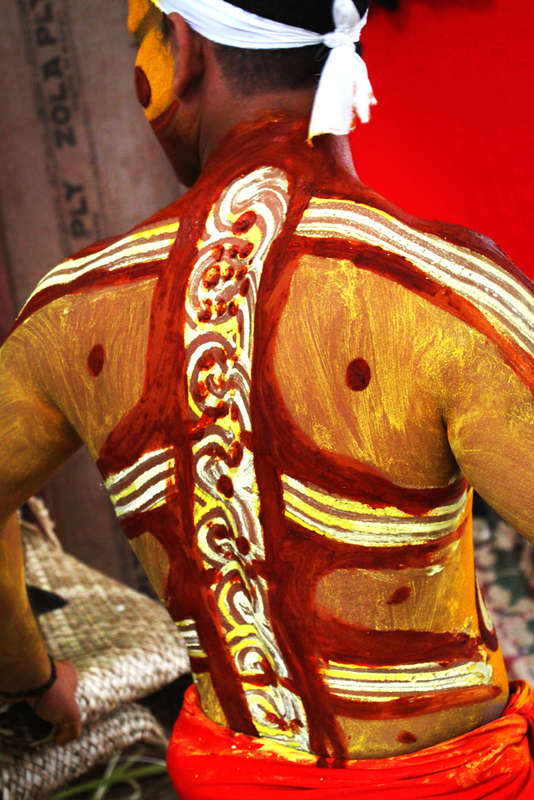 A defined pattern which has veiled connections to the Vedic secrets,’Kuriyola Ezhuthu’ signifies the seven cosmic energy points in human body. ‘Kolakkaran’ the performer who is transforming himself from human to god, indirectly spreading the vedic message ‘Aham Brahmasmi’ which mean I am the god. 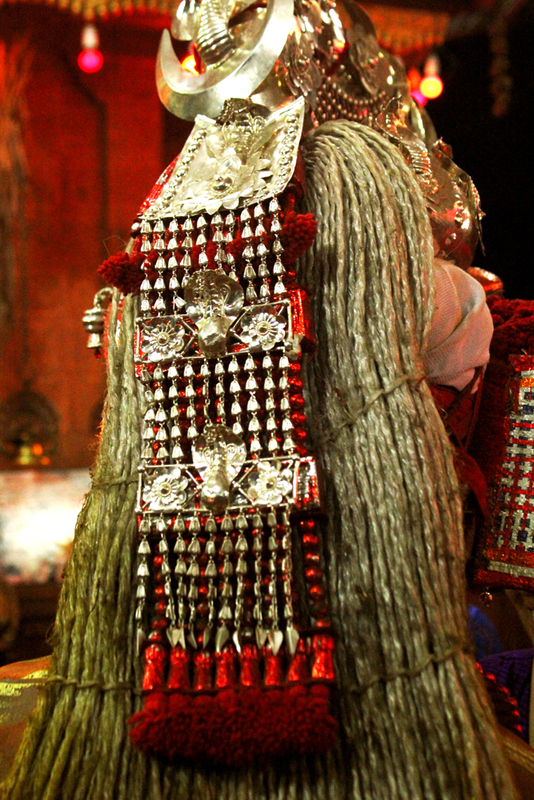 Holy crown of Muthappan and the silver embellishments depicts that he is embodiment of Lord Shiva. 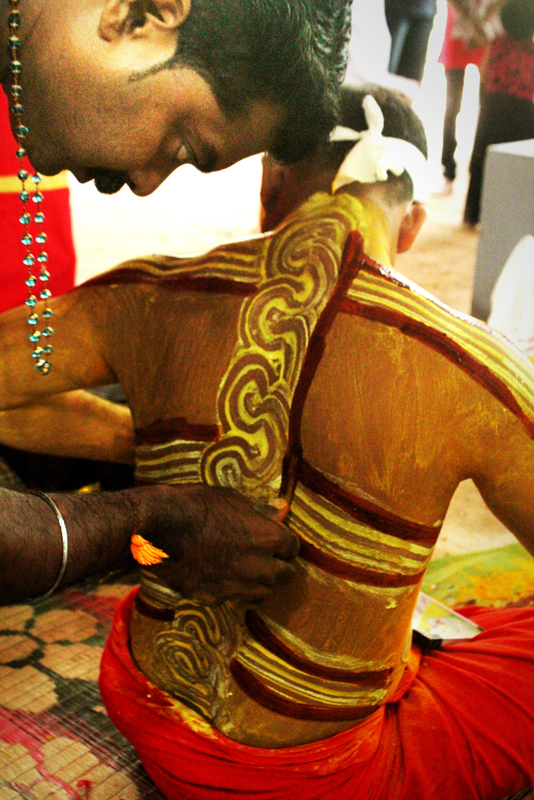 ‘Kuri Kodukkal’ Muthappan is giving blessings to his devotees. 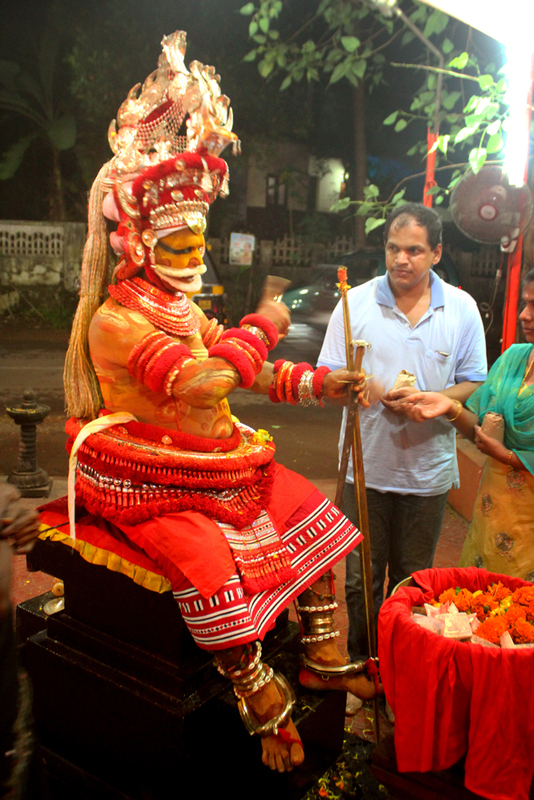 Muthappan or Sree Muthappan is a Hindu folk deity commonly worshipped in the north Malabar region of Kerala. Muthappan is believed to be the personification of two divine figures, Thiruvappana and Muthappan vellatom’ are considered as the manifestations of Lord Vishnu and Lord Shiva respectively. 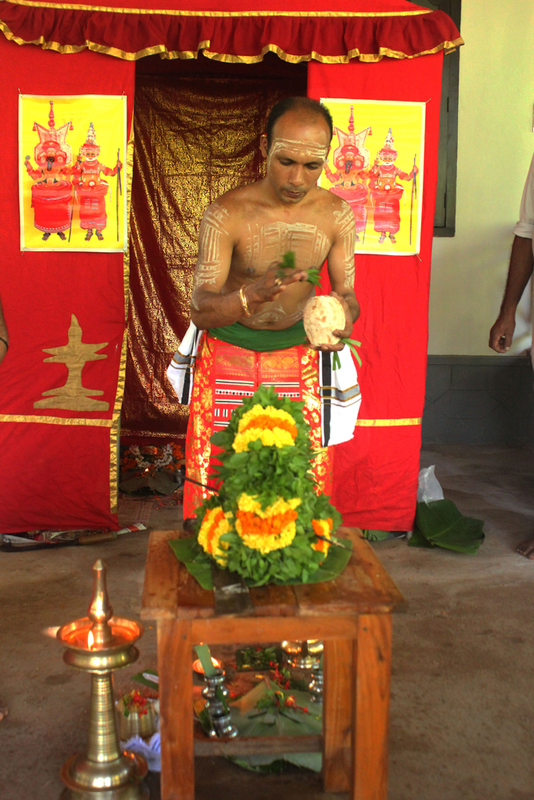 The distinctiveness of this particular ritual is Muthappan is performed the whole year where as in other Theyyam performances are seasonal. The mythological stories depicts that; In north Malabar region of Kerala (present Kannur) there was an illam( in Malayalam Brahmin houses are known as illam or mana) called Ayyangarillam, where the Brahmin landlord and his wife Paadikutti antharajanam( in Malayalam brahmin house wives are known as antarjanam) lived. They had no children and they were very much unhappy over this. One day Paadikuttiyamma went to the river bank to take bath and on her way back, she heard the cry of a baby and followed the blubber. She found a cute baby beating its legs, lying in-between the dried leaves. Seeing Paadikuttiyamma, the baby stopped its blubber. Loveliness brimmed over the cute face. She took the baby and kissed it with great affection. The couple believed that the baby as a gift from Lord Shiva who has helped them by giving an heir to the illam. The mana (house) was filled with happiness and glee. The sandal bed was ready. The illam was reverberated with lullabies. Paadikuttiyamma dressed the baby and fed him. He laughed innocently showing his gum. In that sweet smile, all their woes found its end. The couple didn’t know how the days passed. In the child’s sweet smile, in his tinkling bracelet and also in his prattling sweet talk; they saw a spanking kind of bliss. He acquired the maturity rapidly and they saw it as Lord Shiva’s wonder working play. But their happiness did not stay for long time. They saw some kind of changes in their son’s behavior. He liked to squander the day time fully outside the mana (house). He didn’t like the idea of confining himself inside the naalukett (quadrangular building). His companions were the kurichiyia children (lower caste) living in the hilly area. He wandered about by joining with the low caste people and ate and drank with them. More than the milk rice, he liked the staled rice that he got from kurichiya huts. Paadikutttiyamma was upset over the change that she saw in her son’s behavior. She cried bitterly thinking about her son’s wretched state. Seeing his wife’s state, the Ayyankara Brahmin’s rose into fury. Out of control he blasted. “Living with the hill tribes, eating fish and deer meat you are a sinner! You are not supposed to enter the mana. You can go wherever you like. Ayyankara illam is not a place for you drunkard to enter, “Get out!”- The Brahmin roared helplessly against his son. He didn’t utter a word. Paadikuttiyamma cried appallingly. He neither stood to console his father nor to wipe out his mother’s tears. His resoluteness and steadiness made the father to plunge in grief. After all hopes being shattered, the father collapsed on the floor. The last watch of the night was born. The couple as if in a dream was staggered to see the sight when they opened their eyes. “The treasure of Lord Shiva, their son with thousands of sunshine was sitting on the gem throne”. The sweet smile showered out from the divine figure, wore the bow and arrow and was decorated with the golden jingling anklet and garments. The face was blazing with the divine light. The divine figure looking towards the couple said “Time has come near… it is the time to leave. After leaving, I won’t forget you. Whenever you think about me I will reach near you. Further it is a journey to achieve my birth aim. Bless me and give me the permission to leave.” After saying these words, the miraculous lad continued his journey. Where is he going….! Nobody knew. Crossing the hills and jungles he reached at Kunnathurpaadi, which was naturally so rapturous. For thirty six years by doing penance he stayed along with the children’s of hill at the hilly side. Having nobody to control he wandered by frisking eating and drinking. One day he desired to drink toddy from palm tree. He climbed the palm tree and poured out the pot of toddy into his mouth. The sweet taste of the toddy made him craze. When the pot was empty, he kept the pot in its usual place and slept off. Someone called out from down the tree. Who is that? “The toddy tapper chandan”. He has come to take toddy. After seeing a strange person on the top of the palm tree, he shouted at him. When there was no response, he became angry. “You arrogant creature, come down….. Who gave you the permission to drink toddy? He roared like a lion which echoed till the sky. But the person sitting on the top of the palm tree sat silently, turning a deaf ear to what he had heard. Chandan got irritated, seeing the man sitting idly without any response. He was outraged and tried to shoot the man using his bow and arrows. But what a wonder, the arrow which went straight to the old man was caught and thrown away by the old man. Chandan, who send the arrow fell unconscious and was turned into a rock. The news spread like wild fire. Chandan’s wife wailing came running near the palm tree. She went round Chandan who was turned into a rock. She bowed the old man standing near her and mourned. The Ayyankara Brahmin is struggling to death. Paaddikuttiyamma couldn’t bear it anymore and she is exhausted. She prayed to Lord Shiva to help them and suddenly she thought about her darling son. She grieved for not having a support. 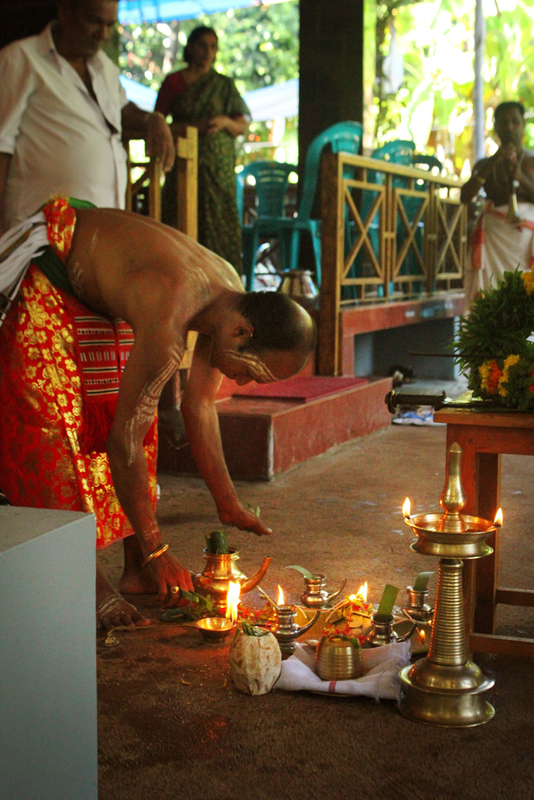 To wipe out the tears of Paadikuttiyamma, people flowed to the illam. Suddenly her son stood in front of her, smiling and was surrounded with the divine light. Brokenheartedly, she embraced her son and cried. The son wiped out his mother’s tears and consoled her. Both father and mother shined in the divine light. Leaving the mana and all their properties to the people, they left their body. Sree Muthappan was glorified as the protector of the village people. 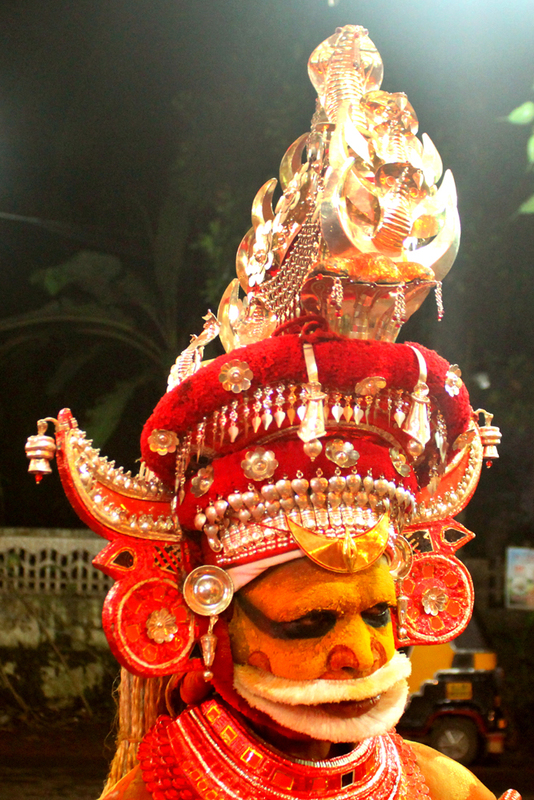 It is believed that by this ritualistic dance performance (Muthappan Theyyam) Muthappan comes and consoles the people. 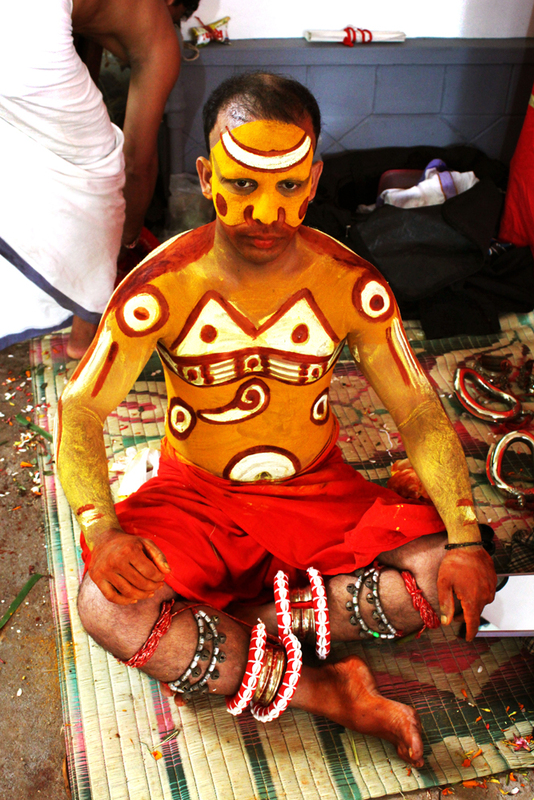 The Performer of Muthappan portrays this story by singing it in a song format and performs dance to create visually appealing. 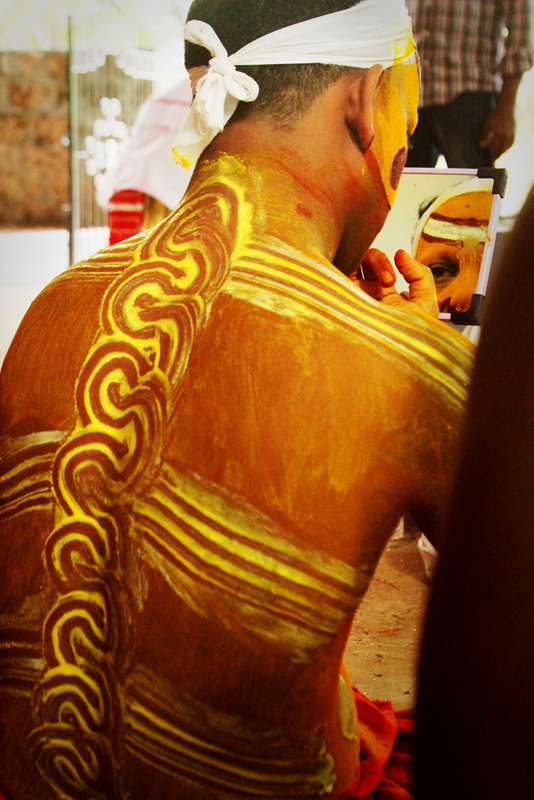 Each Theyyam performances like Muthappan have its own mythological stories and most of folk lore characters are not just human manifestations of gods and goddesses there are plenty of heroic and historic characters who fought against social evilness moreover for the betterment of societies and later on personified as gods and goddesses. 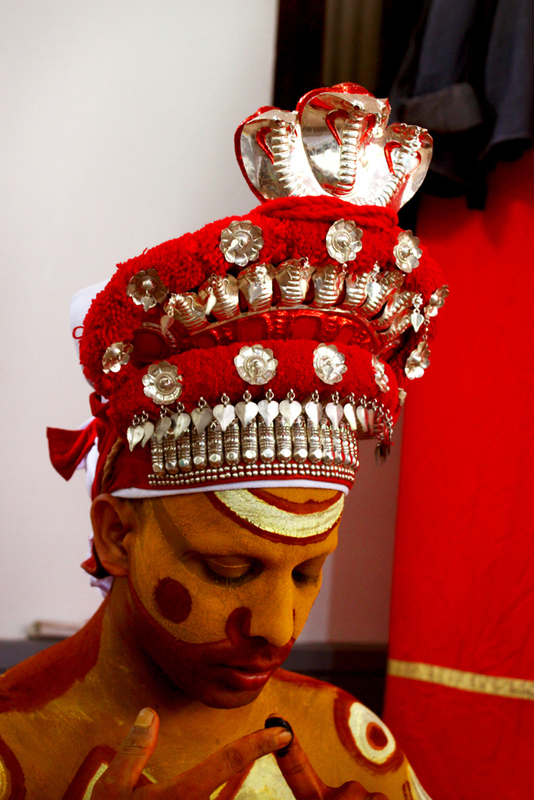 The origin and evolution of Theyyam is not scripted well and preserved, since a long time the stories were passed from generations to generations. According to Bridget and Raymond Alchin, "that a very large part of this modern folk religion is extremely ancient and contains traits which originated during the earliest periods of Neolithic, Chalcolithic settlement and expression" The castism and untouchabiltiy might be a major infused factor of emergence and growth of such folk gods and goddesses as well as folk rituals and practices.